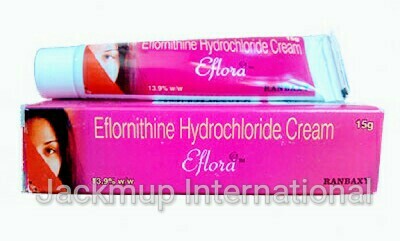 Description:- Eflora 13.9% w/w cream is used in the treatment of facial hirsutism.It stops the activity of a chemical involved in the production of hair on the face. Do not apply eflornithine cream within 5 minutes of using any hair removal technique such as waxing or shaving or on broken or inflamed skin as it may cause irritation. Do not wash the affected area within 4 hours of application of the cream. Do not apply make-up or Sun Pharmascreen on the affected area for at least 5 minutes after application of eflornithine cream. Apply the cream on freshly cleaned and dried skin as directed by the physician. Keep an interval of 8 hours between each application of cream. Avoid contact of the cream with the eyes or nose or any other part of the body other than the intended area. Do not discontinue the treatment without consulting your physician as the hair growth may resume after stopping the treatment. Donot take if allergic to eflornithine or to any ingredient in the medicine. Do not consume if Pregnant or breastfeeding women or women below 18 years of age.